The annual Achilles St. Patrick’s Day 5K has now expanded to include a new 1K Kids Run and a 10K Race for 2019 through the heart of downtown Toronto. We are excited to expanding and celebrating our 20th year of this great landmark event with you and your friends. Register early to avoid disappointment as this we expect to once again sell-out for 2019! Thursday, March 14th, Friday, March 15th, Saturday, March 16th for only. Race Day, Sunday, March 17th - 1K Kids Run start time is 9:45 am, 5K & 10K races start at 10:15 am Sharp! Out of Towners will be able to Pick-up their kits on Race Day, March 17th at Steam Whistle Brewing, 255 Bremner Blvd. starting at 8:30 am. 5K Race is open to all runners and walkers. There will be NO Walkers overall or age categories for 2019. A virtual run is where you can run/walk anywhere…anytime. Run/Walk either the 5K or 10K distance within 30 days of March 17th and we will then mail you an AWESOME finisher medal. Your entry fee goes to support Achilles Canada. Create your team here. Complete the Team Captain registration (only) to receive promo code to register all remaining members via the 5K Team Members option. This new Family Pack will be for family wishing to participate in all races with their family members from the 1K Kids Run for children under the age of 12 years old. Then the teens and parents can run either the 5K or 10K distances. 10K Race however all participants must complete the 10K distance in under 90 minutes. Sorry but NO Walkers, no team category and no age category winners for 2019. A fun 1K Kids Run for children under the age of 12 years old. Steam Whistle Brewing is located on the south side of the Rogers Centre and the Metro Toronto Convention Centre. It is accessible by TTC. 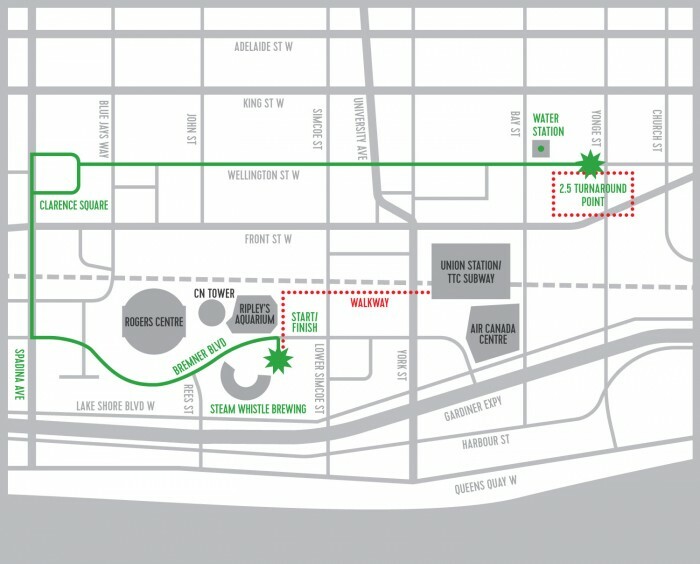 The best way to get to the race is to take the subway to Union Station and then walk the Skywalk as outlined by the red dotted line on the map. 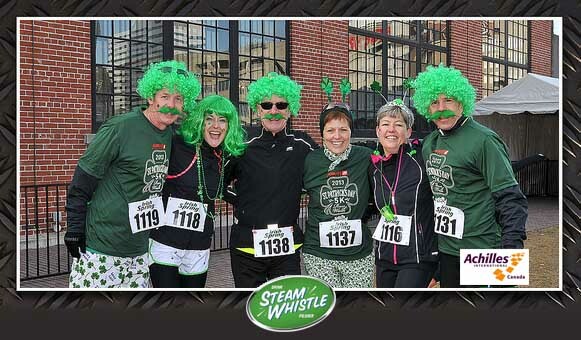 The Start/Finish Line is on Bremner Boulevard in front of Steam Whistle Brewing. The After Party is inside Steam Whistle Brewing. March 17 10:30 AM EDT - Race Starts Sharp!!! No late start for anyone!